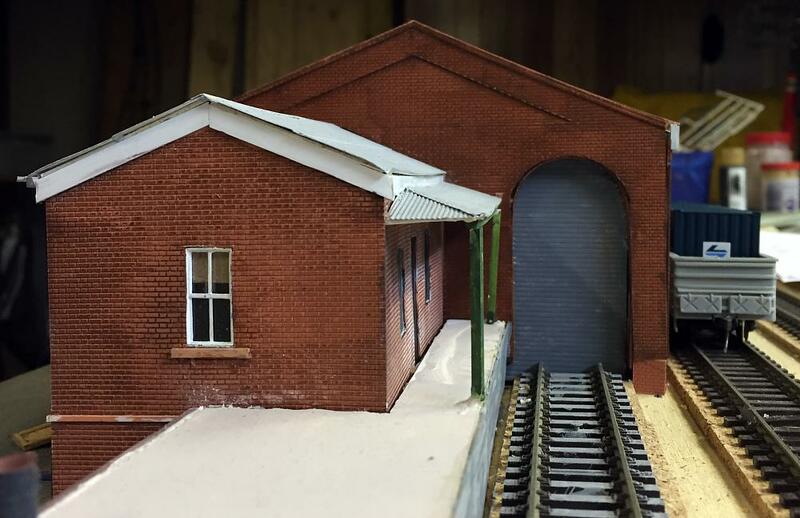 The goods shed is a very big building and it also has additional external platforms and awnings. Like a lot of railway buildings this structure has been added to and altered over many years. We were able to size the structure by referring to railway drawings that clearly showed the main building and the street side platform and office extension. We also had good drawings for the large awning at the Sydney end. For the small office building at the station end and the platform at the Sydney end we had to work almost entirely from photos. As is usually the case we found our own site photos were most helpful for building the entire structure. General view of the goods shed group of structures and awnings. We constructed the carcass for the main part of the building from foamcore board (see the Goulburn June 2015 construction update for details and an image). This was then clad in brick embossed styrene sheet. There were openings left for windows, doors and roller shutters. Roller shutters are represented by V-grooved styrene sheet placed horizontally. Windows and doors are by Tichy or made from old windows and other parts found in the scrap box. When we were visiting the site we could see an old bogie louvre van inside the goods shed building. We decided to replicate this and found a side elevation picture of a JLX / NLJX louvre van and reproduced it at HO scale. This was glued onto a piece of foamcore board and glued inside the main building. The viewer has to really look for it but it can be seen inside the building through the open roller shutter doorway. 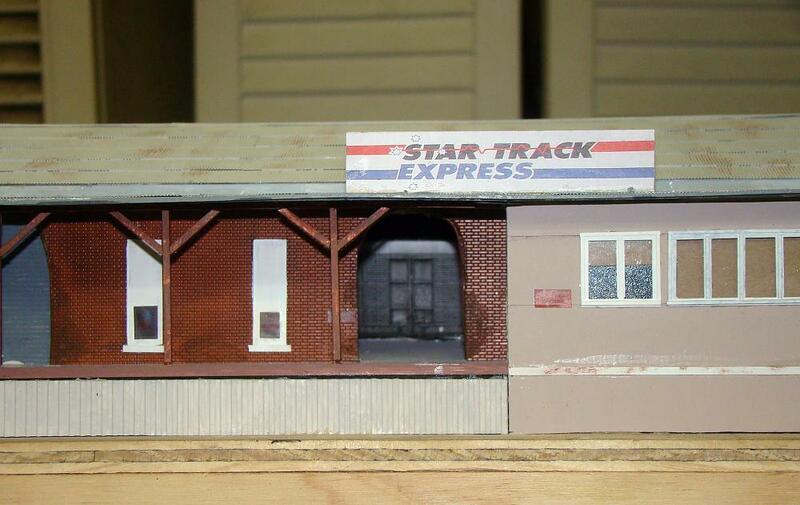 The large Star Track Express sign sitting on top of the roof was made by using one of our photos taken on site and reproducing at HO scale and gluing it to a piece of styrene. The brackets at the back are made from copper wire and securely fixed between the roof and the back of the sign. The open door to the goods shed with a louvre van representation inside. The office building extension at the street side of the main building is constructed of plain sheet styrene with openings left for the windows. The windows were fabricated from strip styrene and made up on the work bench and painted white before being installed. The glazing is clear styrene painted black on the back and the blinds are cut from buff coloured card. The office building at the station end is made from a shell of plain styrene sheet which was then clad in plastic brick sheet. Windows are by Tichy and the other items such as fascias, window sills, and verandah posts are various sized styrene shapes. Again internal blinds were made from buff coloured card. All of the roofs are made by gluing on strips of North Eastern corrugated iron over the foamcore or styrene formers. All the roofs were painted a pale to mid grey colour. Gutters and downpipes are C-section styrene and round styrene respectively, painted grey and glued in place. We glued the building onto the module and weighted it down overnight. By fixing down the main building, street side awning and office building and the office building at the station end, we were then able to come back the following week and work on the 2 platforms - one at the station end and one at the Sydney end of the building - as well as the large awning at the Sydney end. The platform at the station end is built up from layers of foamcore board to get the correct platform height. Onto this we fixed pieces of H-section styrene to represent the rail construction that is typical of many railway loading banks. The styrene 'rail' was painted rust and the foamcore platform was painted concrete. Closer to the station end the platform face is constructed of brick, so we fixed styrene brick sheet to represent this part. Overview of the goods shed and platform at the station end of the module. An MLV louvre van sits on the Down main line. The platform at the Sydney end of the building is a raised concrete platform that is open underneath except for the supporting structure constructed from what appears to be old rail. The underneath is very difficult to see due to the healthy weed and grass growth around this area. We used a piece of foamcore and sat it on smaller pieces of foamcore to raise it up and still achieve the open underneath look. The static grass applicator will get a good work out in this area later on. Overview of the goods shed and covered platform at the Sydney end of the module. We had good drawings as well as good pictures for the awnings at the Sydney end. The awnings are constructed from H-section columns and beams. Styrene shapes were used for this whole structure with strips of North Eastern corrugated iron fixed over the flat styrene roof. The end gable of the awning is open and the steel framing quite visible so we took the time to model this one as accurately as we could. Similarly the structure supporting the raised awning at the front is quite open and visible. The lower part of the H-section columns are concrete encased for which we used styrene tube. The awning supports for the long narrow awning at the front of the building are timber posts, beams and angle bracing. Square section styrene was used for this and painted a dirty brown colour. The awnings at the Sydney end of Goulburn's goods shed. The No. 2 goods shed road is occupied by a tarpaulin covered S truck and MLV louvre van sitting at the platform. The underside of the street side platform at the front of the building is enclosed with sheet metal cladding. We had some ribbed styrene sheeting that looked appropriate leftover from another project so it was cut into strips and glued in place and painted. Overall this structure has taken many weeks to complete but we are quite pleased with the result. Later on the fun part will be adding all the detailing items that abound in this entire area. The goods shed as seen from the station end of the module.